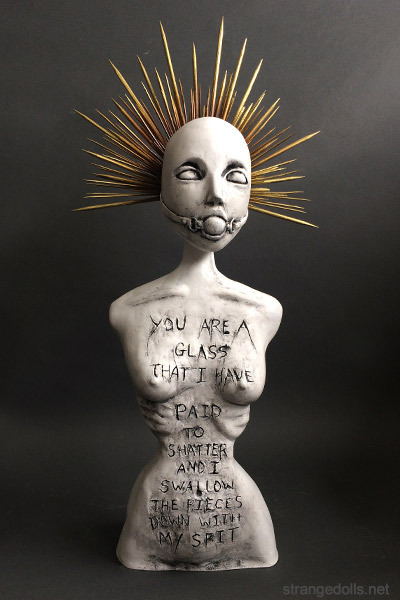 Sculptures that tip toe between the delicate and the grotesque. Every doll is entirely hand made by Vermont artist, Beth Robinson, using polymer clays, vintage fabrics, acrylic paint, and sometimes real human hair or teeth. Each piece is one of a kind. Individuals who love to collect odd, creepy, or gothic dolls will love Strange Dolls. Every October I guest curate The Art of Horror, which is a juried group show at SPACE Gallery in Burlington, Vermont. It is a great way to kick off the Halloween season and celebrate the dark arts. What Happend to Shain Erin?